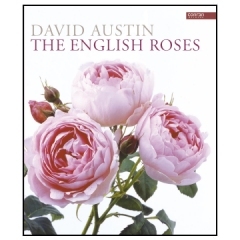 In this book he describes how he set out to combine the beauty and fragrance of the Old Roses with the repeat-flowering and wide colour range of the Modern Roses. ‘The English Roses’ features exquisite new photographs and detailed descriptions of his best-loved and more recent varieties. Here for the first time, he presents an entirely new classification of his roses, which helps us to appreciate them better and to understand their great diversity. He describes the characteristics of the original Old Rose Hybrids; a group he has called ‘The Leander Group’ which leans a little more towards the Modern Rose in appearance; The English Rose Musk Hybrids; English Alba Hybrids and English Climbing Roses. Each group has its own unique beauty. With The English Roses, David Austin has returned to the flower form of the Old Roses and has created and re-introduced many different rich fragrances. With their pleasing, shrubby habits of growth and their ability to flower continually throughout the summer, The English Roses are amongst the most beautiful and useful of garden flowers. ...any rose lover will be impressed with this book. What a beautiful book to have or give as a gift!